A lost friend. A family tragedy. A psychopathic scientist driven by greed. All Shannon Dane wants to do is be with his girlfriend, Ally. So when tragedy strikes her family, he’s willing to do whatever she asks. Even break into Rat City, the run-down mansion owned by her geneticist uncle. But what Shannon discovers could rip their lives– and the lives of a generation of teens – into shreds. 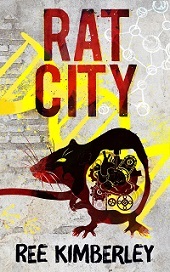 Rat City is available at Amazon, Google Play, iBooks, Kobo and Barnes and Noble.